Three months would elapse before I found myself back once again at Hollingbourne station, ready to tackle another section of the North Downs Way on a Saturday morning in late January. The leaves had gone and the trees that lined the track out of the village stood bare. 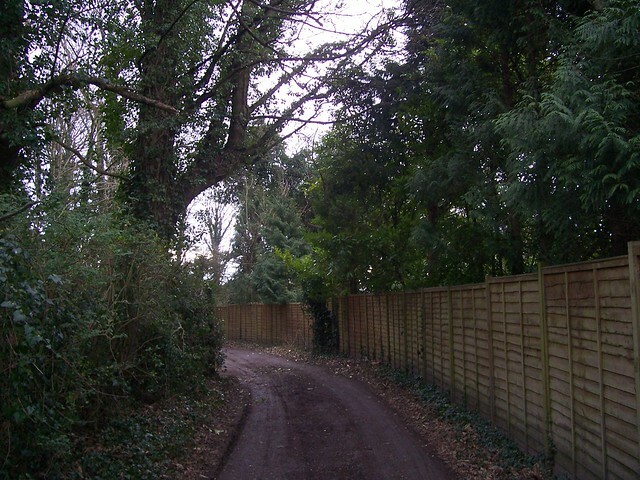 I strolled up through the village and rejoined the tree lined lane that would lead the North Downs Way further east. The lane soon became a muddy quagmire before reverting back to tarmac again; a pattern that would continue for most of the day. I hadn’t been out walking for months; not since I’d last been on the North Downs Way funnily enough, and when my feet had started itching this hadn’t been what they’d had in mind. I wanted something stimulating. Exciting views, the odd hill or two. But instead I got several miles of road and track, with just the odd glimpse of a main road visible through the trees. The only excitement was flinging myself into bushes to get out of the way from the car that had just hurtled down towards me at breakneck speed. The lane was clearly popular with motorists as another car pulled up – completely failing to endanger my life in any way – in a small lay-by next to an information sign and a man sat on a bench. He was a pilgrim, decked out in full pilgrim clothing. Rough cloth robes, dodgy hair cut, the works. He looked rather happy to sit on the bench and rest his feet awhile, and it was clear he wasn’t going anywhere soon. Although that was mainly as he was a statue and made out of wood. The nearby sign invited me to imagine what it must have been like to be a pilgrim on this route all those years ago. There was just one small flaw with that request. The North Downs Way walker passes so many roads named Pilgrim’s Way or Pilgrim’s Road that they may wonder why the trail simply hasn’t been extended to Winchester and renamed accordingly. However the Pilgrim’s Way of today, marked on maps and on road signs, is actually a Victorian creation and was put on the map in the 1860s by an Ordnance Survey officer without any actual historical basis. Of course pilgrims did walk from Winchester to Canterbury; that much is known. But did they use this exact route? It’s highly unlikely. They would have followed a general route, but travelled along a variety of different tracks and roads to complete it. They certainly wouldn’t have sat on such a modern looking bench either, and no pilgrim would have enjoyed the sights of the large factory in Marley that the route took me past shortly after. A little way on, winter wasn’t doing the Lenham Millennium Project’s work much justice. In the year 2000 a whopping 2000 trees had been planted by local volunteers, but now just the bare branches were visible. More impressive on a mild January morning was the nearby Lenham Cross, cut in to the chalk of the hill. A memorial to those that died in the two World Wars, it was first carved in 1922 before being covered over again following the outbreak of hostilities in 1939. 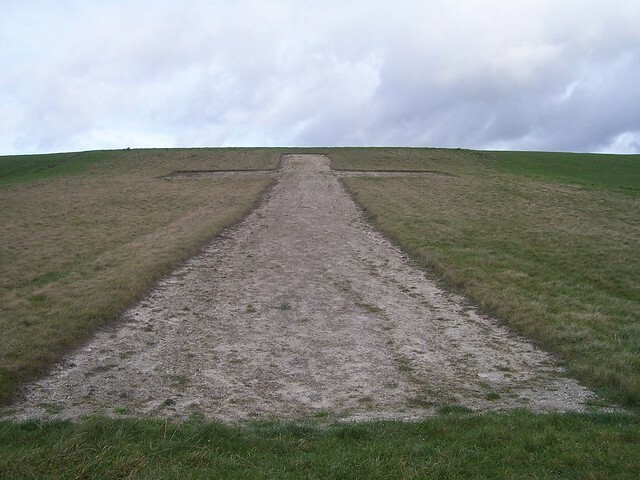 The large, distinctive cross would have been easily seen by the Luftwaffe bombers trying to find landmarks, and it would taken until the end of war in Europe before the cross was uncovered again. Today it shines on, clearly visible from the village below. Then, and for reasons completely unknown, my guidebook declared I should look out for a disused sewage works. It never revealed why I should do this. Was it some amazing art deco sewage works? Did it play its part in some historical event? The guidebook never explained. I never found out what was so good about it as I couldn’t find it, although I did see a large pile of rubble suggesting the sewage works might have been demolished. Either that or I just wasn’t paying enough attention. But then we’re hardly talking the most exciting thing to view. Nor did the off road motorbikes which seemed to plague the track, do much to improve matters; their revving engines filling the area with noise, and their tyres churning the soft ground in to mud. Houses appeared every now and then; isolated and seemingly far from their villages but always in large clumps. With my stomach rumbling I attempted to find a lunch spot, but the endless track/road combination wasn’t exactly full of benches and those that did exist were constantly full of immobile wooden pilgrims. In the end I had to resort to sitting on a handy tree stump where I hungrily dug out my lunch only for the weather to turn. There had been dark grey clouds all day, with the odd glimpse of sunlight in the distance. But now I’d sat down, the wind whipped up and light rain started hitting me. Naturally as soon I’d given up and started walking again, it all calmed down. Road walking is one of the major problems with walking in the South East of England, as is the fact that you frequently find yourself walking down past houses and their inevitable boundary fences and walls. Go up somewhere like the Dales or Peak District and such things will be rare, but here in the garden of England everyone has to protect their expensive little empire from prying eyes; driveways hidden behind giant gates opened only after the entry of the correct keycode. 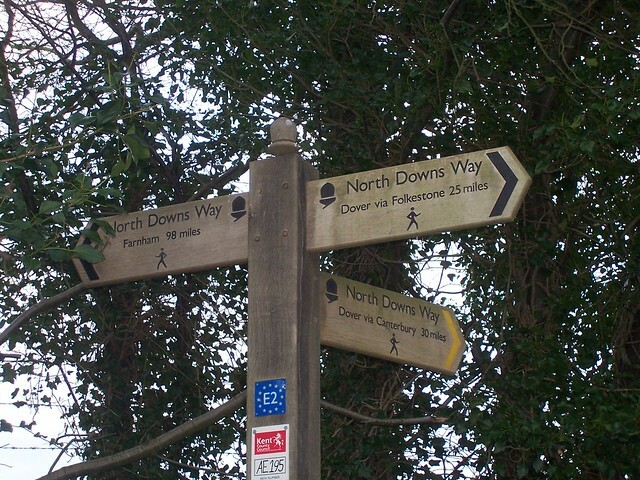 As the North Downs Way approached the village of Charing I found myself walking along another such example of empire building and when a signpost presented me with two North Downs Way signs pointing in different directions, I took the opportunity to escape. A red disc told me I could continue to follow the byway with its oppressive fences, whilst a yellow one pointed to a footpath up Charing hill. Ready and wanting to escape, I chose yellow. The short but steep climb quickly gave me a grand view of the surrounding area, and at the top a windmill greeted me too. However as I followed the path I realised something was not quite right. There aren’t many parts of the North Downs Way where there are alternative routes to pick and this clearly wasn’t one of them. With no trail waymarks visible at the top of the hill it was clear that the one I’d followed in the first place had been placed there by mistake. There was a path, but this wasn’t the North Downs Way I was on. Figuring that I’d be able to pick up the proper route soon, I followed a series of roads in what I hoped was the right direction but with no real idea of just where I was. When I met a main road I was confused even more. Following it down, I wondered how one minor detour could turn out to be such a big diversion. 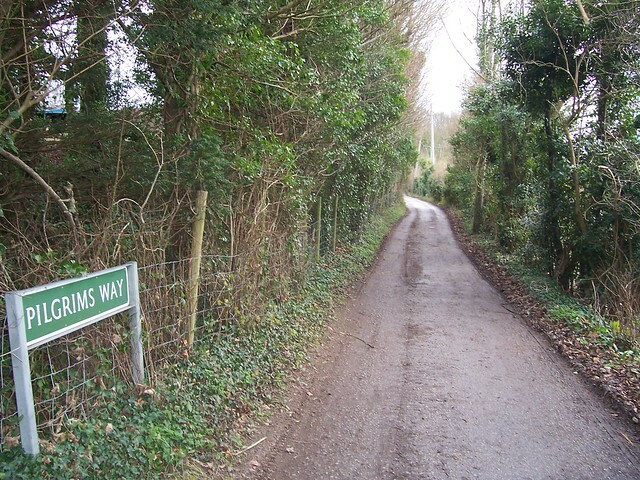 It took me about twenty minutes before I finally stumbled back on a road named Pilgrims Way, and once I was on it I certainly wasn’t going to leave it. After spending most of the day on gravel and tarmac, my arrival at Dunn Street was a welcome one as, for a short while at least, the North Downs Way finally abandoned the roads and headed alongside fields as it weaved its way through Eastwell Park. Sheep happily grazed away in front of a farm and I took a slight detour to see the ruins of St Mary’s Church. 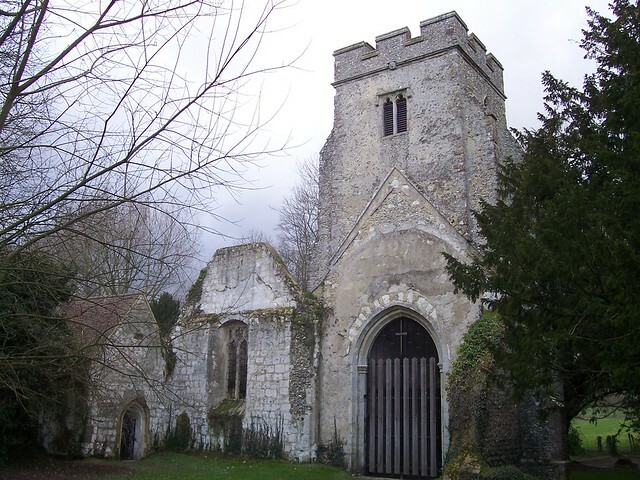 Now maintained by the Friends of Friendless Churches, the 15th century St Mary’s has been in a ruined state since the nave roof collapsed in the 1950s. Quite how it had got so bad wasn’t easy to find out, with some blaming bombing during the second World War. Whatever the situation, the site is now a Scheduled Monument; the ruins protected by the force of law. Near a sign asking drivers to drive on the left, the Way left the grounds of Eastwell Park and hopped along the village green of Boughton Lees, passing near the enticing looking Flying Horse Inn. But there wasn’t time for a quick pint. The sun would be setting in a mere hour and I needed to get to Wye before it did. Before I got there though, I’d have to make a decision. A decision every North Downs Way walker must take on their walk. One that would affect the rest of the walk to its core. Most walking trails don’t have options, and those that do don’t have a huge difference between the two alternatives. Several in the North, like the Coast to Coast and Cumbria Way, have the odd high and and low level options, whilst the South Downs Way has a different ending for those needing a bridleway as those on bike or horseback can’t traverse the cliffs at the Seven Sisters and Beachy Head. The North Downs Way is different. It has two substantially different endings, and the two options diverge just outside Boughton Lees. They both meet up again at Dover, but there’s a significant difference between them. 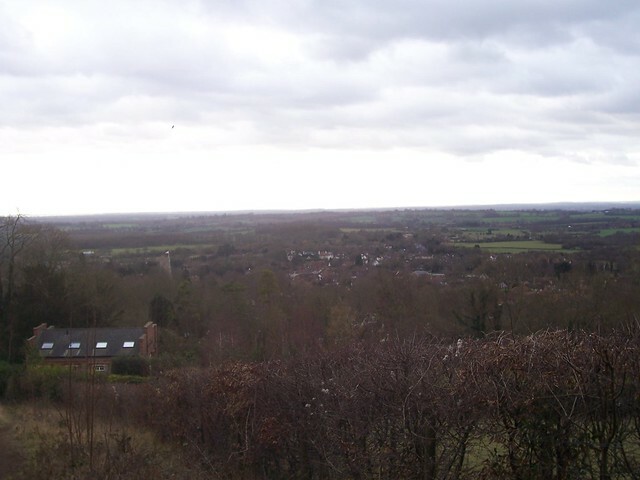 The northern part goes to Canterbury first, allowing modern day pilgrims to follow the North Downs Way to get there. The southern option instead heads to Folkestone with gives a cliffside ending, as well as lopping five miles off the distance and giving the walker a view of World War II relics and the Channel Tunnel. As it happened, there wasn’t much choice for me. I had to head home and the nearest railway station was at Wye, a short distance away on the southern section. But as I traipsed through an orchard, windfall apples rotting on the ground, I pondered my options for when I’d return. North, or south? Religion and pilgrims, or cliffs and war. Sitting on the platform waiting for my train, I made a decision. But implementing it would have to wait until my next visit. When I got to Boughton Lees I took the northern option, purely because it seemed to better fit logistics of getting home, but decided pretty much straight away that when I got to Dover I’d simply carry on back up the other leg back to the above signpost, therefore, doing both. I got as far as Chilham and haven’t been back since, so am now seriously considering doing the southern leg instead to get the cliffs and returning along the northern. I really do need to get down there and finish this off. I couldn’t believe how difficult a decision it was to make for me. Even when I made it I kept trying to change my mind. It struck me as a strange decision to offer two such dramatically different endings to the route. It was an easy decision for us as we were walking direct from our house in Rochester to my parents’ house in Canterbury! No other transport involved. I have just read through your narrative with interest. My daughter and I and a friend of hers are planning a sponsored walk this year. I am reaching the milestone of 70 and would like to raise money for Cancer Research UK for whom I am the local treasurer and the other two may have different aims. 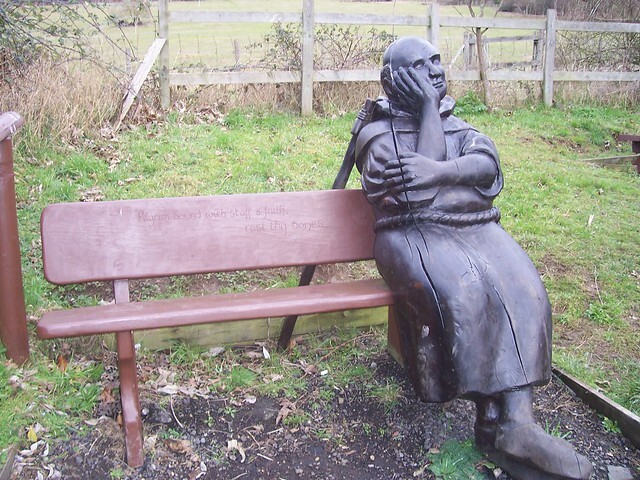 We would like to follow the Pilgrims Way from Hollingbourne to Canterbury. Would you be kind enough to let me know whether there are any unpassable areas which you are aware of currently. We will certainly wait until the weather is more clement but any advice before we seek sponsorship would be helpful. Hello Felicity. Best person to ask would be the trail officer, who can be contacted via the official North Downs Way website. They’ll have the best information on the current state of the trail. First Published: 13 February 2013. Last Updated: 24 November 2014.